So it begins – another adventure! The next couple of years will be filled with days of approving and sometimes disapproving. My competition seems fierce but after you’ve wrangled with house cats and tangoed with tricksy dames, how could anyone else compare to a sheep such as myself. I shall go wool to wool with them. I will put on my best coat and embrace the people with every fiber of my being. Join me in the preparation of a campaign never before seen. We will stun. We will astonish. We will prevail. We will bring home the bacon. 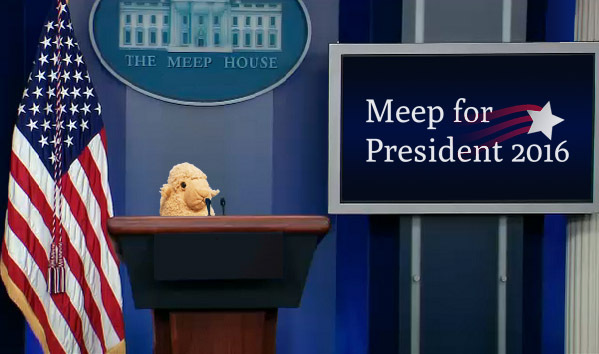 And that reminds me to bring home some bacon for the fantastic Meep Party tonight. Everyone should celebrate this and more fine days. This entry was tagged adventure, bacon, meep. Bookmark the permalink. Finally, a candidate who won’t pull the wool over our eyes! Seeing how I have to pull the wool back from my own eyes at times, that is a true statement. And I approve of that!